One of the best parts of the holiday season are the Christmas traditions that come along with it. Make the season more memorable in the office by creating a warm, fun atmosphere to help everyone enjoy this holiday season. We have included our team's favorite office traditions and events to bring extra joy to your work place this Christmas. 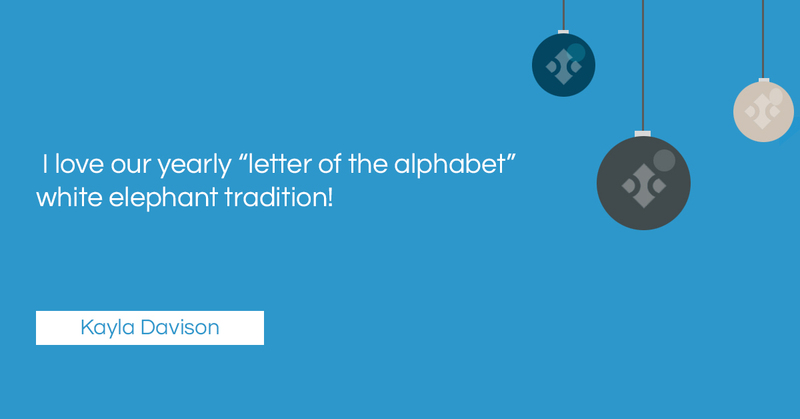 Not every holiday tradition needs to be extravagant, we love connecting with clients by sending a simple handwritten holiday card. Not only is it fun for our team to reminisce about the amazing projects and progress we’ve made throughout the year, it lets our clients know we are thankful for them and are wishing them a happy holiday season. From a new coffee mug to the latest smart watch, everyone feels appreciated when they receive a gift from their boss. Here at Blue Compass, our leadership team is known to express how much they care by incorporating gift giving into a game. We’ve played Jeopardy, What Do You Meme, Charades, Pictionary, Guess That Domain Authority, Heads Up and more. This creative way of acknowledging our team efforts builds comradery and spreads that office holiday cheer, all at the same time. A favorite tradition in our office is the “Year in Review” video our President and co-founder, Drew Harden, puts together. Give your office “video guru” a chance to shine by offering them the opportunity to gather your company’s favorite pictures, quotes and video clips into a short film. Fellow team members will have fun reflecting on the year and enjoy a few laughs along the way. A popular and timeless tradition that gives everyone a chance to pull out their favorite homemade knitted sweater, is an “Ugly Sweater Contest.” This festive and fun Christmas tradition will inspire out-of-the-box creativity and is an excuse for a casual dress day…score! Collecting votes for a chance to win a unique prize will spur even the most introverted team members to participate in this fun office activity. 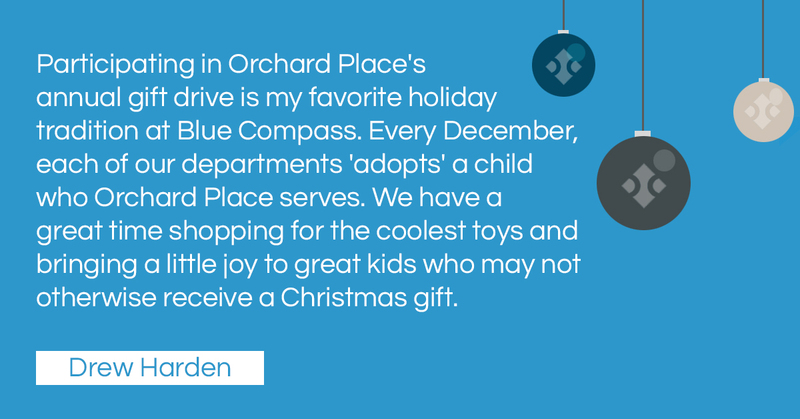 Spread your company’s holiday cheer by participating in a toy drive for those less fortunate. Any donation will go a long way for those in need this time of year. Holiday traditions such as this will show everyone on the team that their company is one to be proud of. Collect all of your team members’ names in a hat and ask everyone to pull one name revealing whose “Secret Santa” they will be this year. It’s an easy Christmas tradition to start that everyone will love, featuring the combination of giving and guessing. Just make sure to set the price limit at something everyone can afford to ensure all are included. Whether it’s a goofy gift or something you know they will love, exchanging mystery gifts will be a team building activity for everyone in your office. It’s also a fun Christmas tradition the whole team will enjoy, have a few laughs and walk away with a memorable souvenir. Our Blue Compass team plays this office game every year at our holiday party, it never fails to make for a great afternoon. Surprising gifts have even included pet fish for the office (letter F) and a bucket of earthworms (letter E). Whether it is during the workday or on a Saturday night, the entire organization will enjoy the fun activities while taking a break from work and doing a little mixing and mingling. Cater in, provide the drinks and plan a few office games or team building activities to really get the ball rolling. Holiday parties will make for a wonderful holiday tradition your team and their “plus one” will look forward to each year. There is no greater feeling than giving back, and the holidays is a perfect time to combine resources and help people in need. Create a poll for your co-workers to vote for their favorite charity in hopes of winning the grand prize of a company donation. While charity donations are wonderful, there are other ways to give back as well. Plan fun office activities for your team to take a day to help serve at a local homeless shelter or bring dry goods to a food pantry. Find something your team is passionate about and this will be a holiday tradition everyone will want to keep for years to come. No matter what your fun Christmas traditions are, what’s most important is spending time together and creating a culture everyone can enjoy being a part of. Happy Holidays from our Blue Compass team to yours!